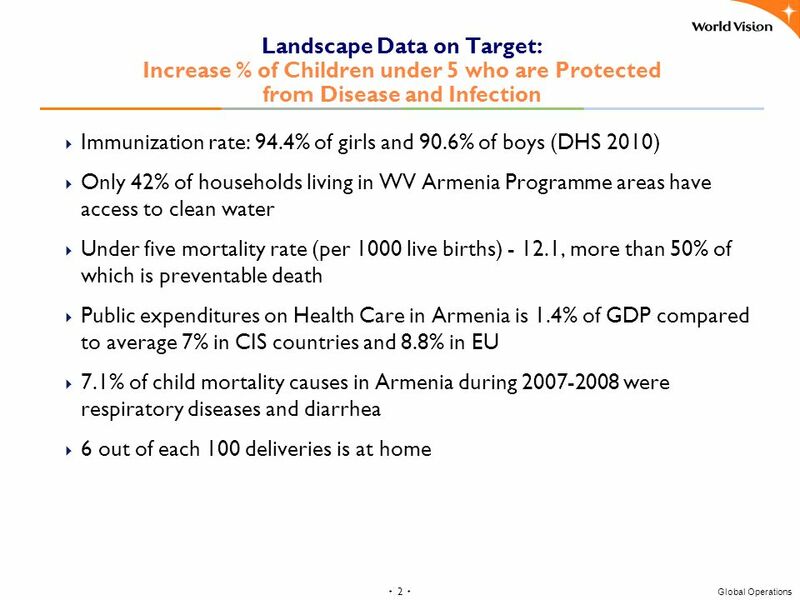 ٠ 1 ٠ Global Operations Landscape Data on Target: Increase % of Children who Report Improved Level of Well-being 31.4% of population in Armenia living. 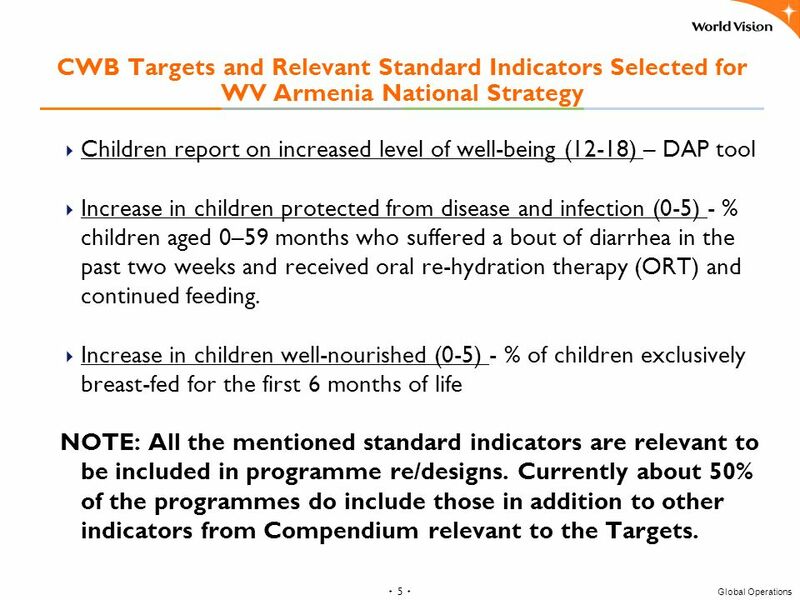 5 ٠ 5 ٠ Global Operations CWB Targets and Relevant Standard Indicators Selected for WV Armenia National Strategy Children report on increased level of well-being (12-18) – DAP tool Increase in children protected from disease and infection (0-5) - % children aged 0–59 months who suffered a bout of diarrhea in the past two weeks and received oral re-hydration therapy (ORT) and continued feeding. 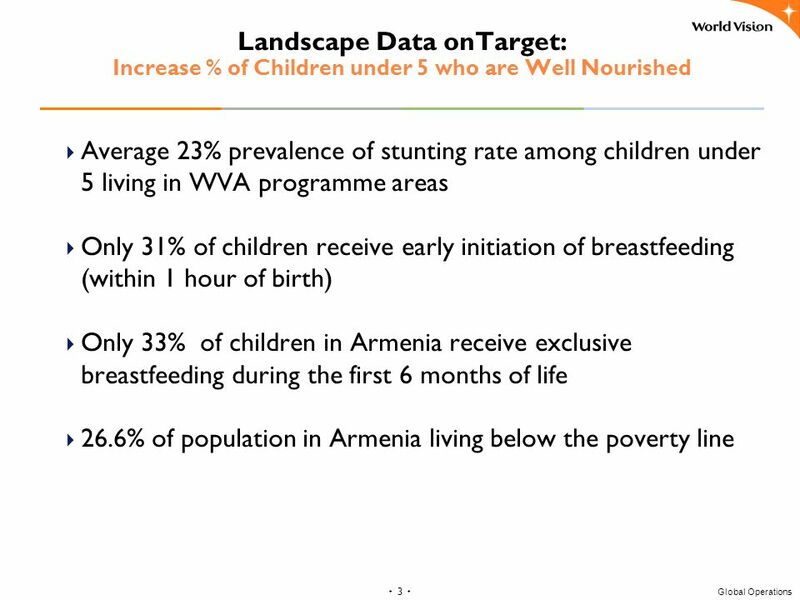 Increase in children well-nourished (0-5) - % of children exclusively breast-fed for the first 6 months of life NOTE: All the mentioned standard indicators are relevant to be included in programme re/designs. 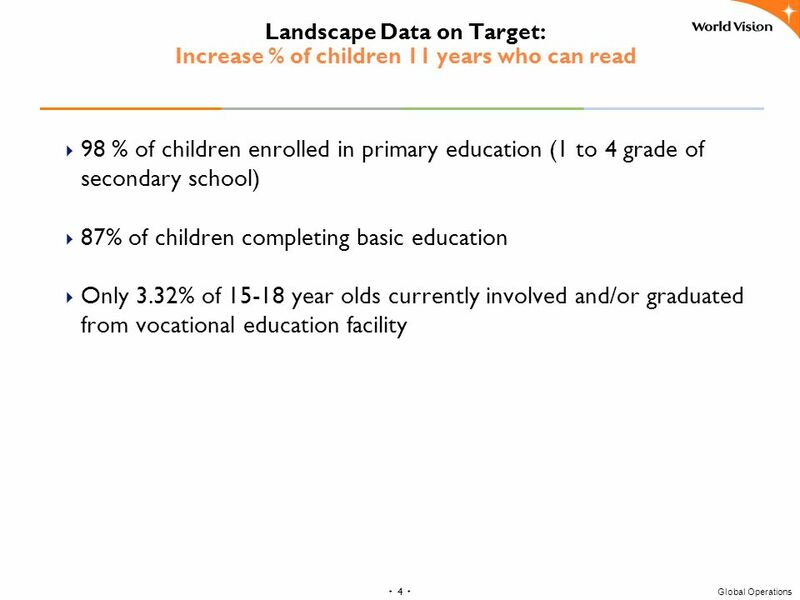 Currently about 50% of the programmes do include those in addition to other indicators from Compendium relevant to the Targets. 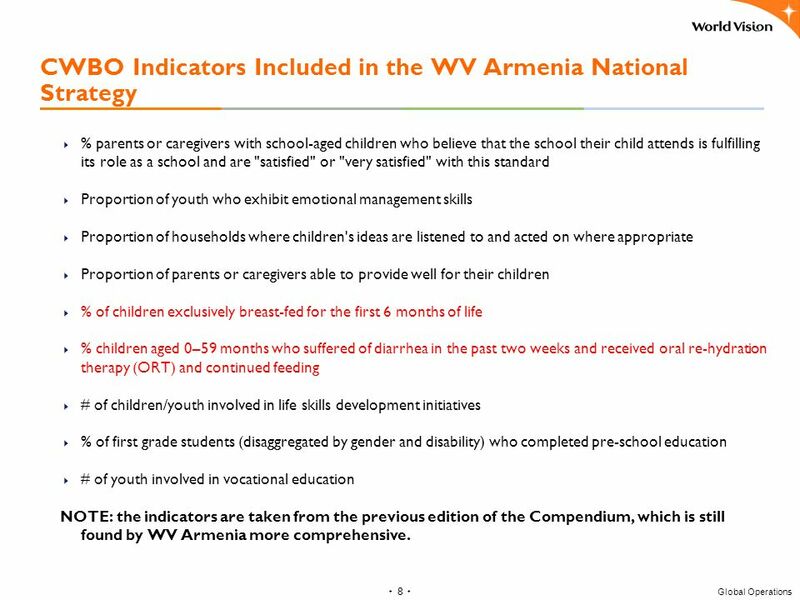 8 ٠ 8 ٠ Global Operations CWBO Indicators Included in the WV Armenia National Strategy % parents or caregivers with school-aged children who believe that the school their child attends is fulfilling its role as a school and are "satisfied" or "very satisfied" with this standard Proportion of youth who exhibit emotional management skills Proportion of households where children's ideas are listened to and acted on where appropriate Proportion of parents or caregivers able to provide well for their children % of children exclusively breast-fed for the first 6 months of life % children aged 0–59 months who suffered of diarrhea in the past two weeks and received oral re-hydration therapy (ORT) and continued feeding # of children/youth involved in life skills development initiatives % of first grade students (disaggregated by gender and disability) who completed pre-school education # of youth involved in vocational education NOTE: the indicators are taken from the previous edition of the Compendium, which is still found by WV Armenia more comprehensive. 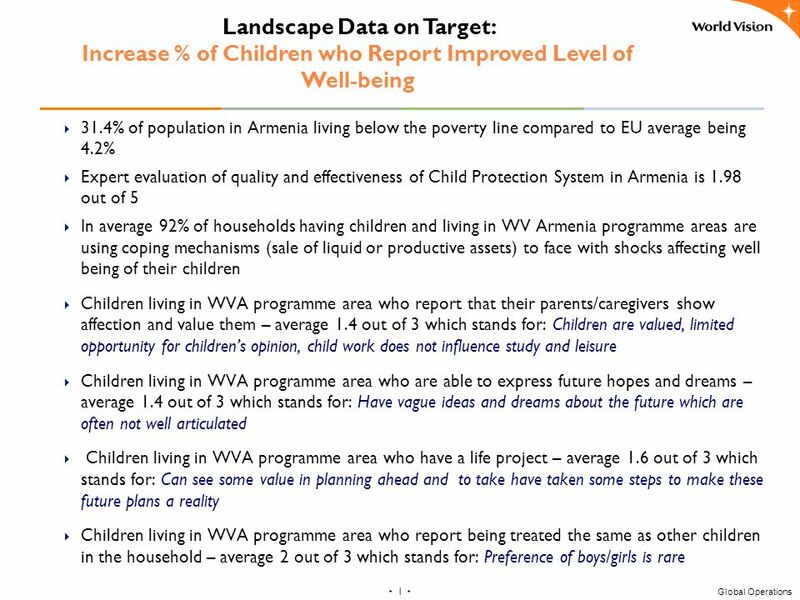 Download ppt "٠ 1 ٠ Global Operations Landscape Data on Target: Increase % of Children who Report Improved Level of Well-being 31.4% of population in Armenia living." SCANNING THE NO STRATEGY THROUGH CWBT LENSES 2 nd WebEx Meeting For EARO Pilot National Offices for Annual Reporting on CWBT, November 10, 2011 Godfrey. MICS3 in the Context of Global Commitments and Reporting Needs. Oral Rehydration & Continued Feeding MICS 3 Data Analysis and Report Writing. Pneumonia MICS3 Data Analysis and Report Writing. 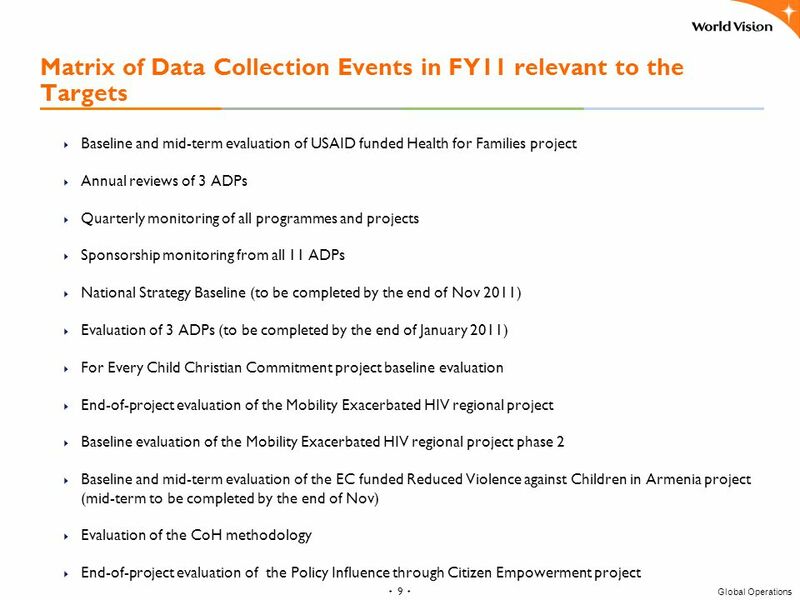 MICS 2006 KEY FINDINGS on Child Health and Maternal Health Samuel Bosomprah Ministry of Health MICS Focal Point. Health statistics in MICS and DHS – a gendered perspective Holly Newby Statistics & Monitoring Section UNICEF ESA/STAT/AC.219/12. The CRPD as human rights instrument and tool for achieving the MDGs. Conference of State Parties 31 October, Charlotte McClain-Nhlapo Senior Operations. Regional Strategy: Programme Communication for Child Survival in West and Central Africa Neil Ford Regional Chief, Programme Communication West and Central. Almudena Fernandez Luis Felipe Lopez-Calva UNDP Regional Bureau for Latin America and the Caribbean London, 9 November 2009 Transitory Shocks, Permanent.